Forty-four years after its first attempt at developing a commercial jet, China finally has a home-grown airliner — the Comac ARJ21-700. The new regional finally received certification on Tuesday, after twelve years in development, with six of those years spent in flight testing. Let's have a look. Keeping it simple, Comac stands for Commercial Aircraft Corporation of China, and ARJ stands for Advanced Regional Jet. Aviation buffs know that China has built commercial planes before, but those were on behalf of other manufacturers, or a blatant copy like the Y-7 / Antonov AN24. Even today, Airbus has an A320 assembly line in Tianjin. This is the first airliner designed, built, and certified by China. If you notice similarities to the McDonnell Douglas MD-10, that is because the company responsible for the program had also built MD-80s in China, and Aviation Week says the MD-80 design "was referred to," but not fully copied. The ARJ21 program was launched in 2002, and certification work began in 2003. The government-funded program received little attention at the time, because the country wasn't putting much emphasis on commercial aircraft. China had attempted to build its own commercial plane in the 1970s - the Shanghai Y-10. The plane flew 130 flights between 1980 and 1984, when the project was abandoned. China couldn't find a market for the plane, because by the time it was developed and ready to fly, its native state-run airlines already a fleet of more modern and efficient planes. The ARJ21-700 will seat 70-90 passengers, depending on configuration, while a larger ARJ21-900, (still in development) will seat up to 115. The ARJ is powered by twin rear-mounted General Electric CF34-10A engines, each providing 18,000 pounds of thrust. The plane will have a range of 2,299 miles. The flight deck is fitted with Rockwell Collins' Pro Line 21 avionics suite. Comac is also developing a larger jet, called the C919. It will be about the size of a Boeing 737-700, seating 158 people. It's not expected to enter service until 2018. 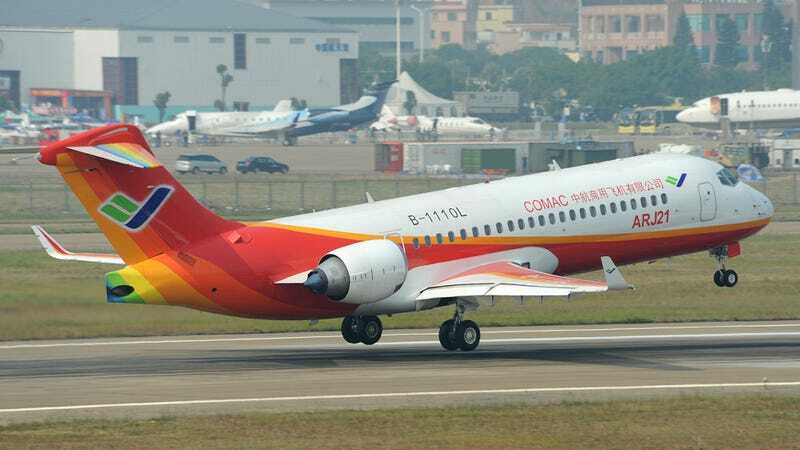 The first airline to receive the ARJ21-700 will be Chengdu Airlines, which coincidentally is owned by Comac. Delivery of the first plane is currently slated for April or May of 2015.